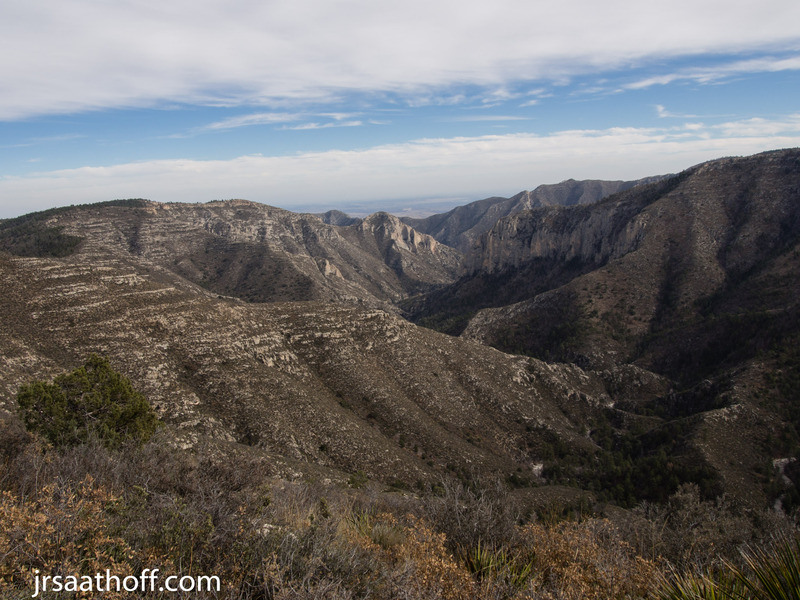 I took a road trip out to Guadalupe Mountains National Park a few weeks ago with a couple friends of mine for some mid-December backpacking. 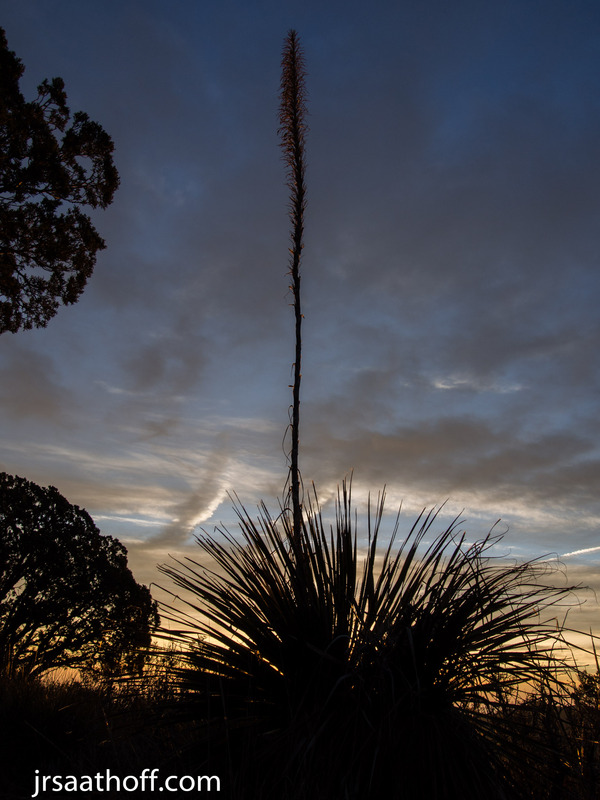 It’s a ten hour drive from Houston to GMNP and on the way is Balmorhea State Park, a place I’ve been wanting to visit for years. 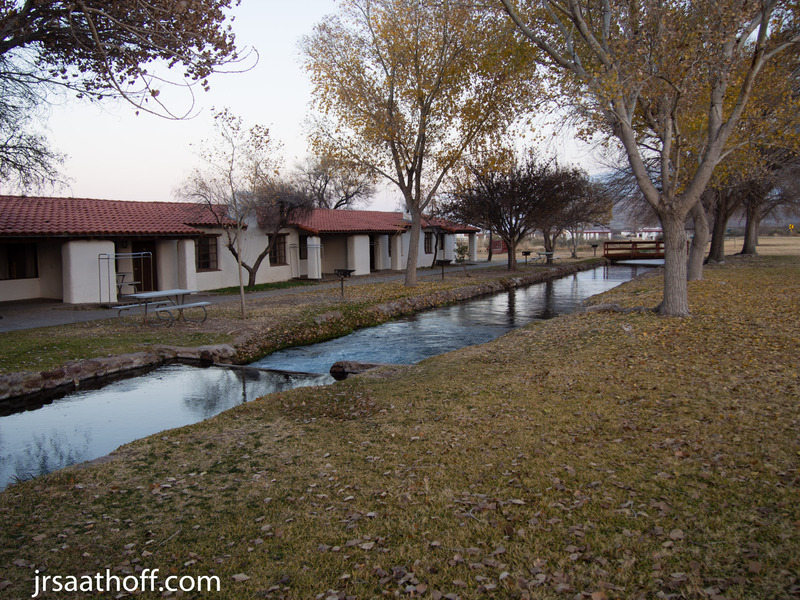 So, with the excuse to break up the drive to GMNP, we decided to stay the first night at Balmorhea State Park, which is only eight hours away from houston. 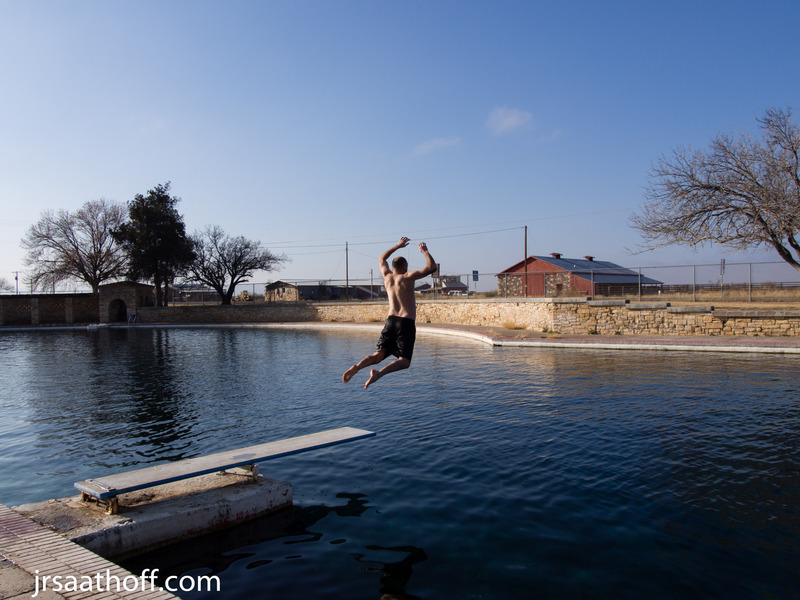 The main appeal of this park is the unique pool, which was built by the Civilian Conservation Corps in the 1930s. 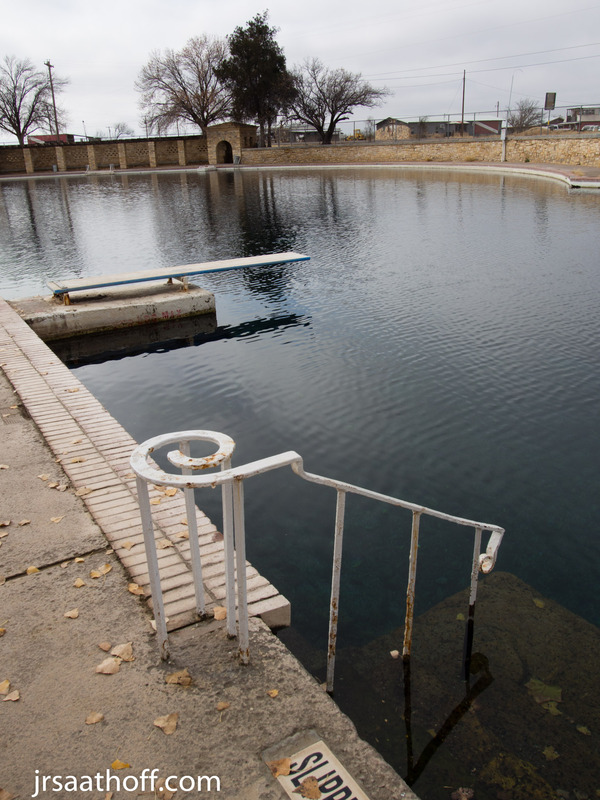 It’s a huge pool, filled by a natural spring, and equipped with several diving boards and water depths ranging from four to twenty-five feet. 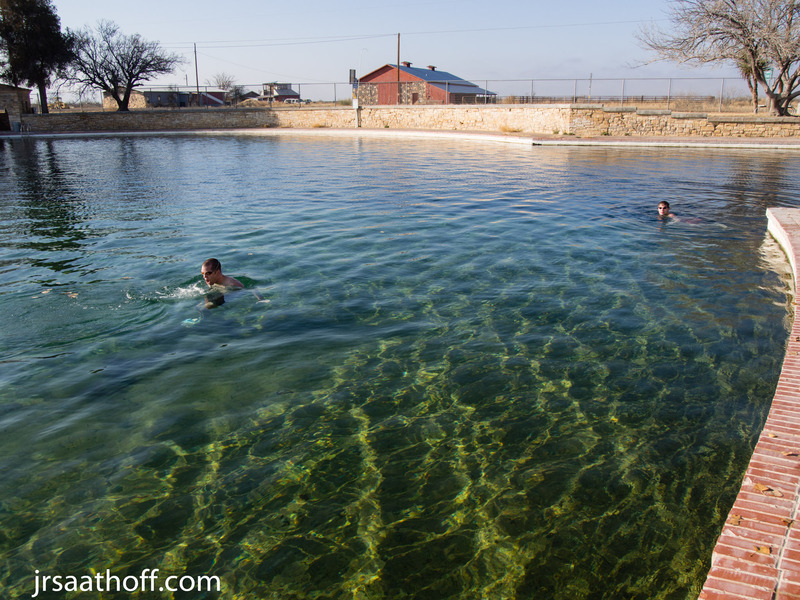 The pool is filled with native fish that swim along with you, the concrete walls are covered in algae, and you can see the rocky bottom through the clear water. 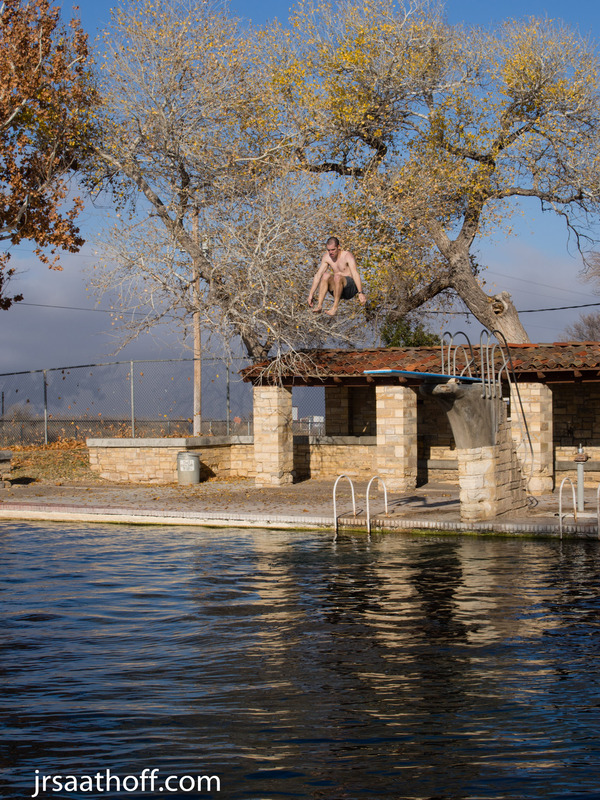 But, most importantly, the water is 72-76 degrees year round, so it’s a great travel destination even during the winter. The park rangers said that the place is packed during the summer, but otherwise it’s usually not very crowded. We were the only people that stayed overnight in the park, and despite spending several hours at the pool, we only saw two other people come and go. The park has standard camp ground, but we opted to stay in one of the park’s cabins, positioned along the stream coming from the pool. 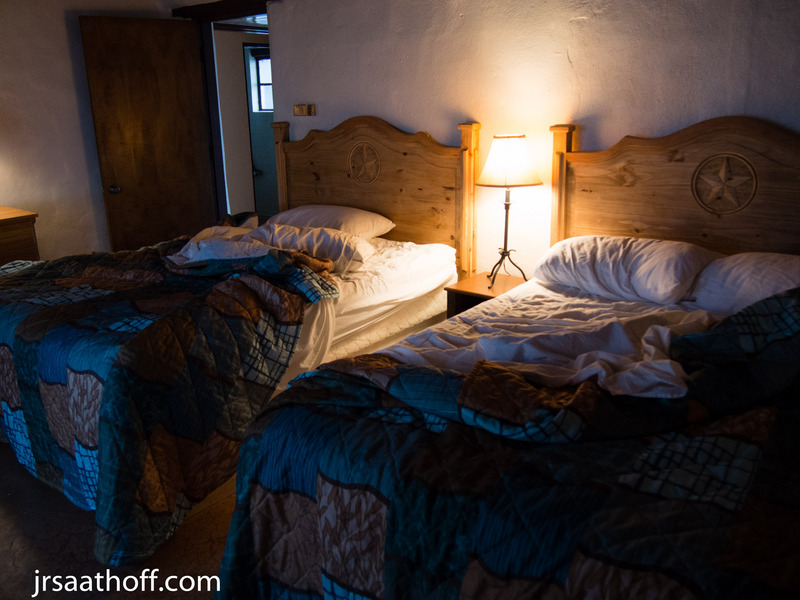 The cabin was equipped with a shower, heater, three queen beds, and a grill. And, since it’s only two hours away from GMNP, it’s a perfect luxury stop-over before beginning a backpacking trip the next morning. GMNP is a pretty barebones park. I never made it to Dog Canyon, which is in the North, but the amenities in the rest of the park are pretty limited. There are no showers (the Pilot Travel Stop in Van Horn has them for $12), no gas stations, no restaurants, and no stores. There is no burning in the campgrounds, not even charcoal (propane stoves are allowed). 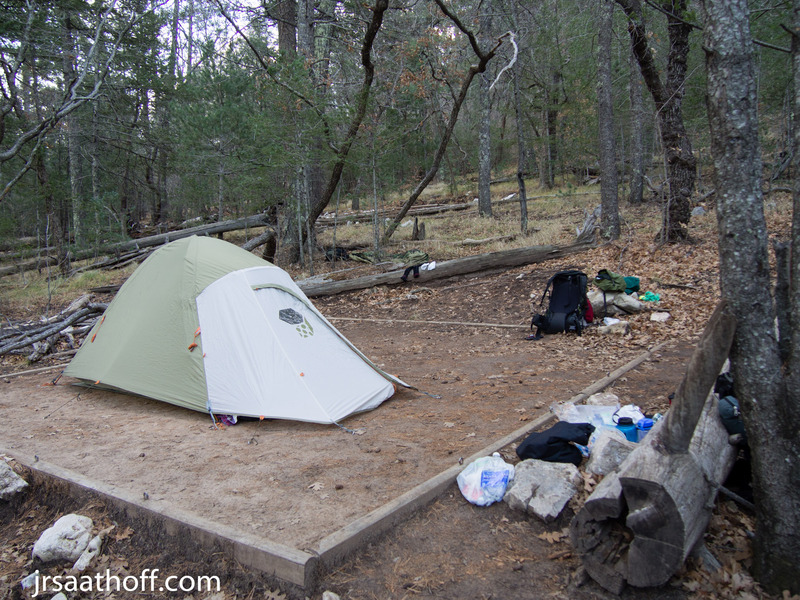 All the campgrounds and backpacking permits in the park are available on a first-come first-serve basis. 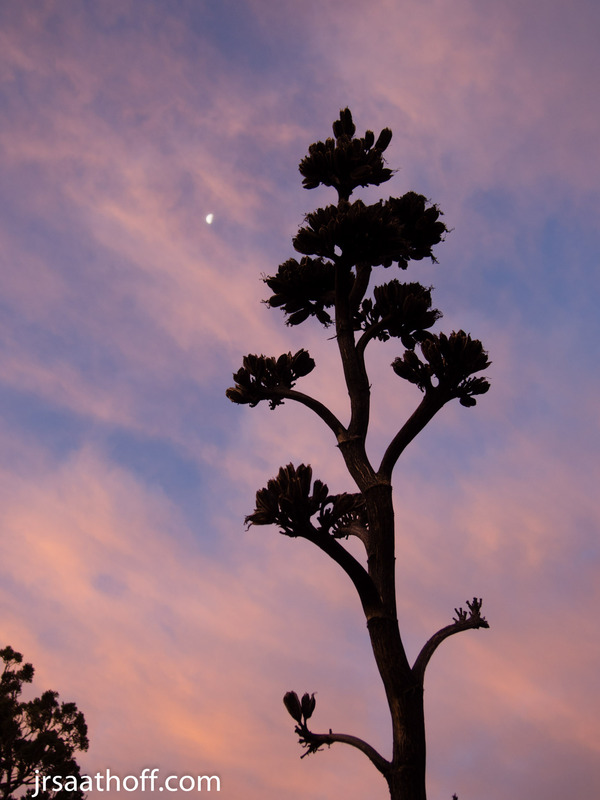 In October the trees change color, making that the most busy time of the year for this park. When we visited in December, there seemed to be few crowds and an abundance of bored park rangers. 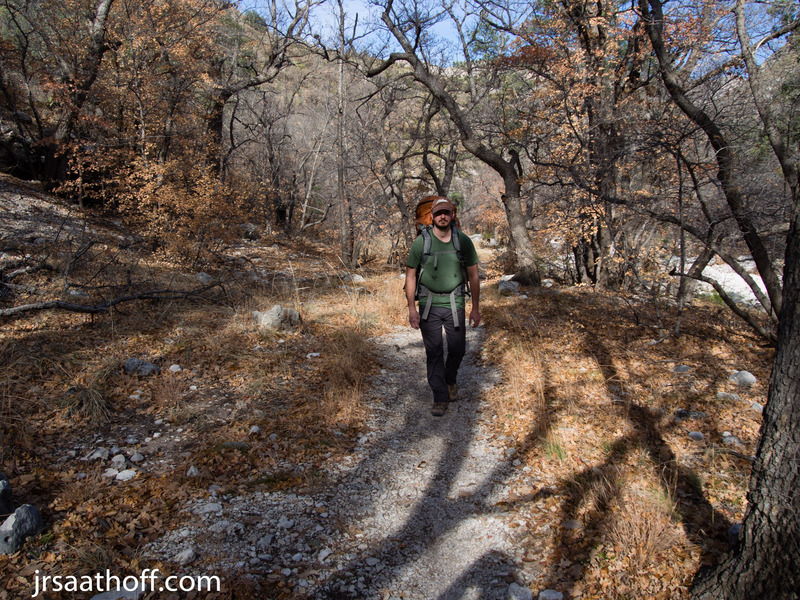 So, although that meant we had our permits checked by several random rangers before we got onto the trail, they were all eager to talk about our plans and recommend their favorite parts of the trail. 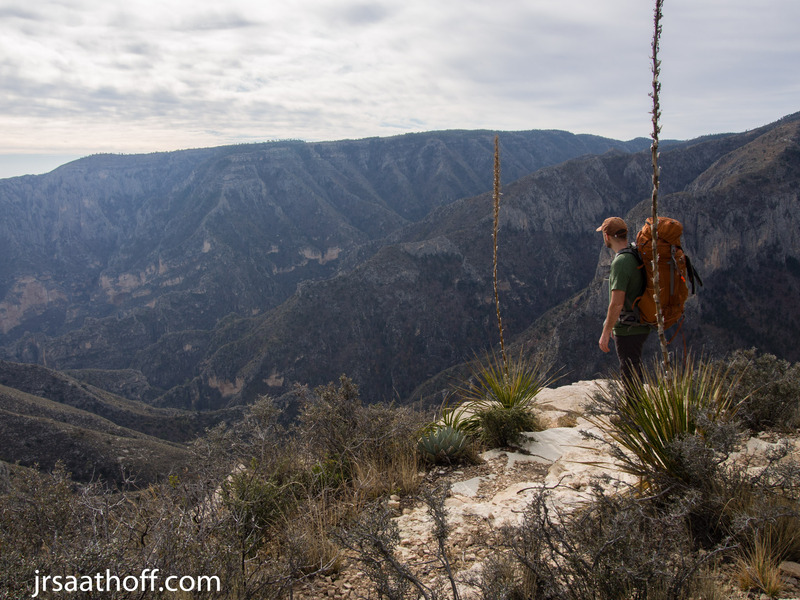 We decided to backpack from McKittrick Canyon to Pine Springs, staying at the Tejas and McKittrick Ridge backcountry campgrounds, followed by a day hike to Guadalupe Peak, and car camping the last night at Pine Springs. We were fortunate to have two vehicles, otherwise this trip wouldn’t have been as easy. 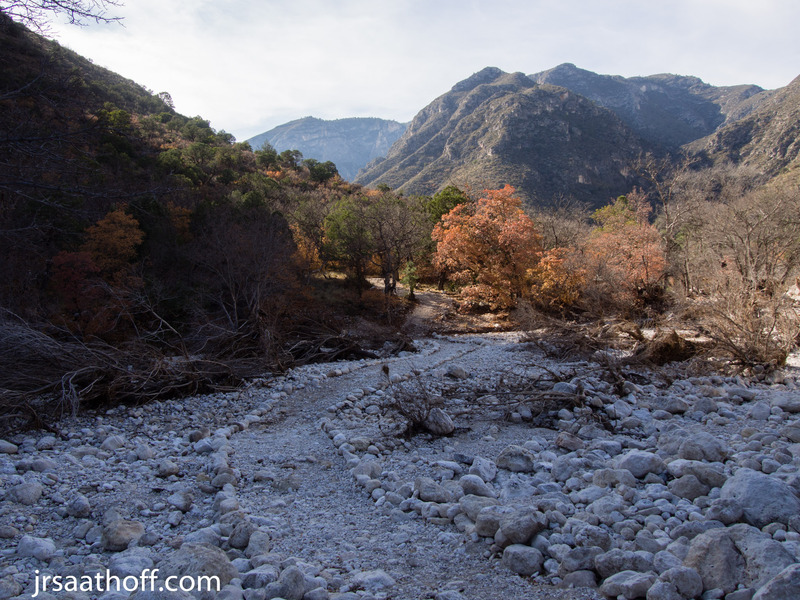 There are no shuttles from Pine Springs to McKittrick Canyon (there was a good amount of vehicle traffic so hitchhiking might be an option), but since we had two vehicles we left one in Pine Springs and drove the other to the trailhead at McKittrick Canyon. 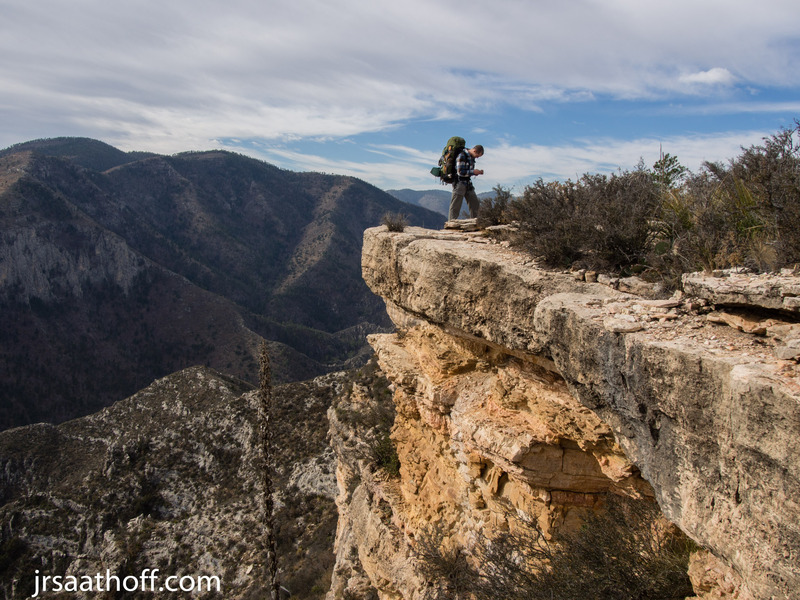 There are no water sources in the backcountry, and the NPS recommends one gallons of water per day above dehydrated food requirements. 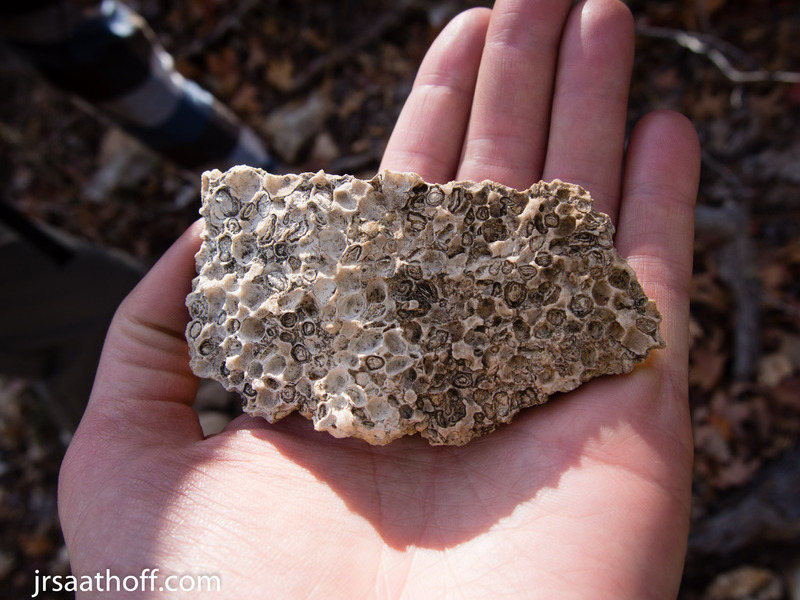 The dehydrated meals I took to eat would require approximately 2L, and I took out 8L above that for drinking directly, which proved to be just about perfect since I ended the hike with only half a liter remaining. 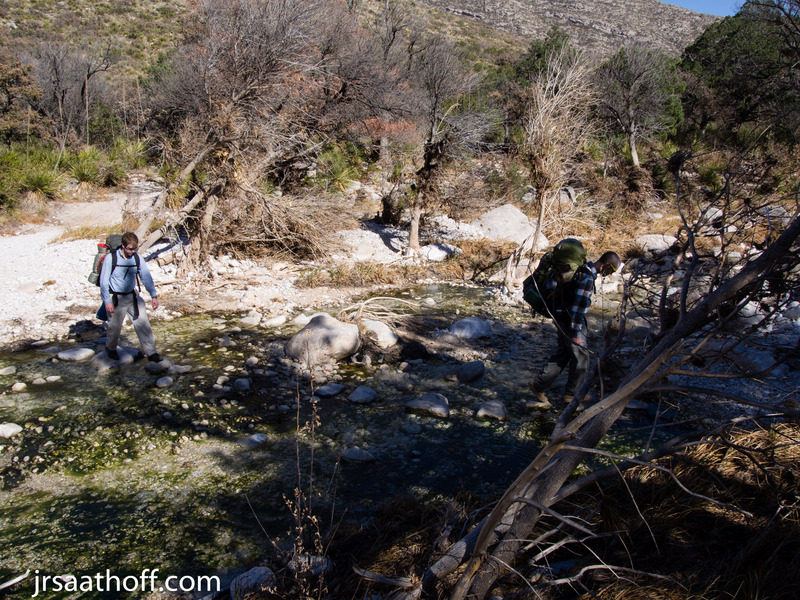 All that water meant the first day was pretty rough with several thousand feet of elvation gain and a pack weight of approximately fifty pounds. 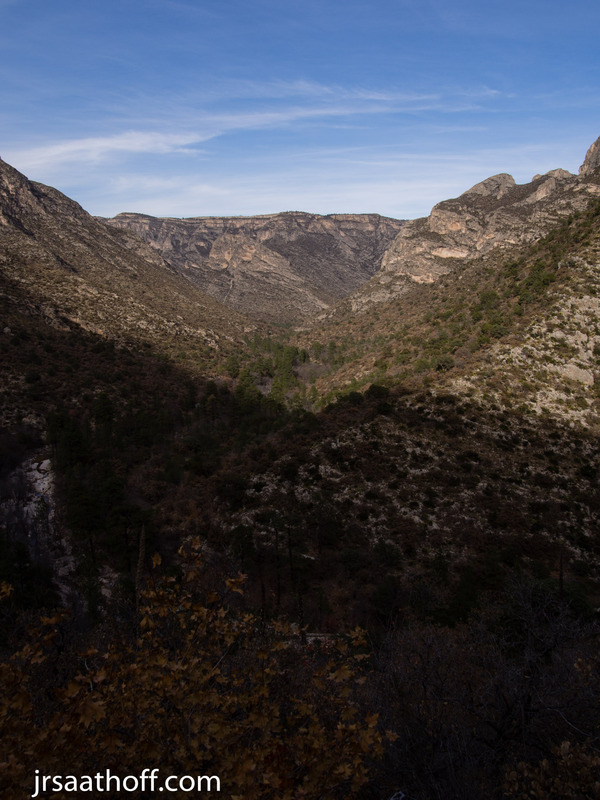 The first part of the hike takes you through the bottom of the canyon along a dry wash surrounded by the towering canyon walls. As you progress, a stream appears and suddenly instead of the typical desert vegetation, deciduous trees appear, including oaks and maples. 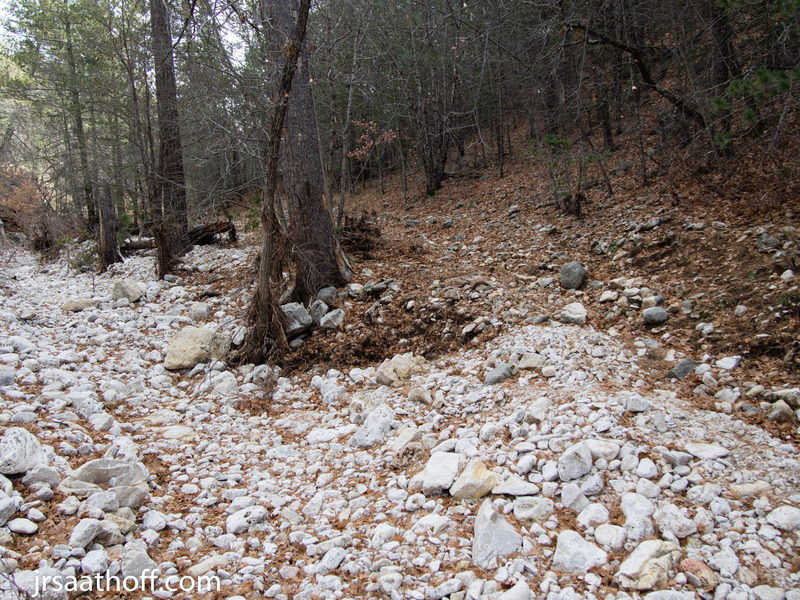 This part of the trail is a pretty easy hike without much elevation change. 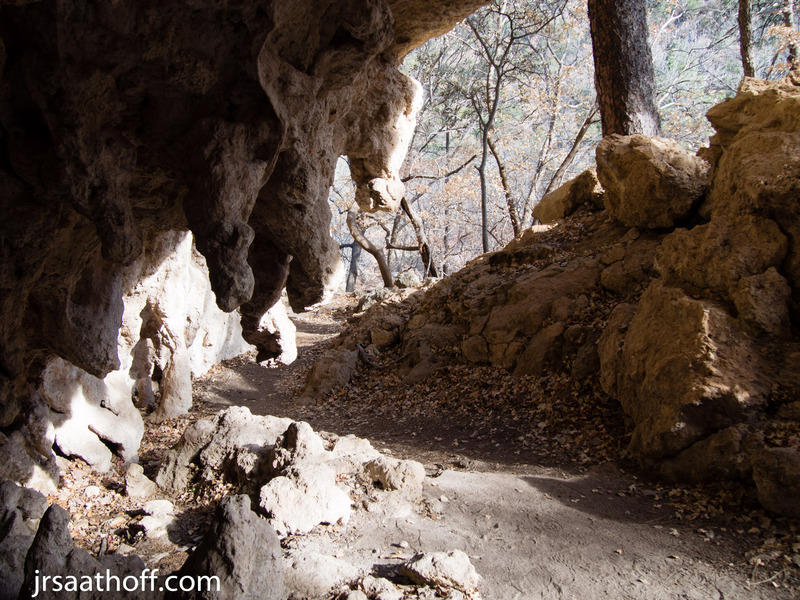 Along the way you’ll pass the Pratt Cabin, and after a total of 3.4 miles, you’ll reach The Grotto. 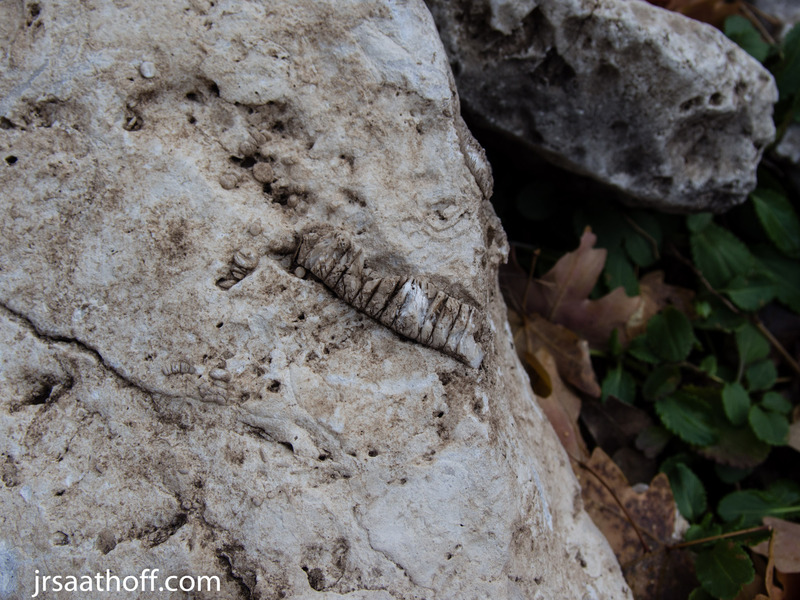 It’s a small limestone “cave” with stalagmites and stalactites, and although the name grotto implies a historic use by humans, I couldn’t find anything on the history of the site that explains where the name came from. 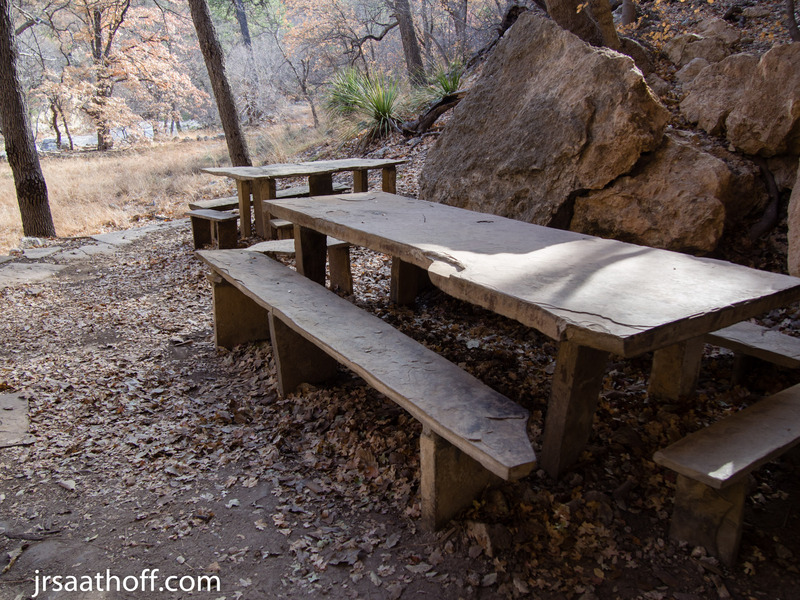 In any case, there are some gorgeous stone picnic tables here to take a break and have lunch before starting the difficult accent to the McKittrick Ridge. 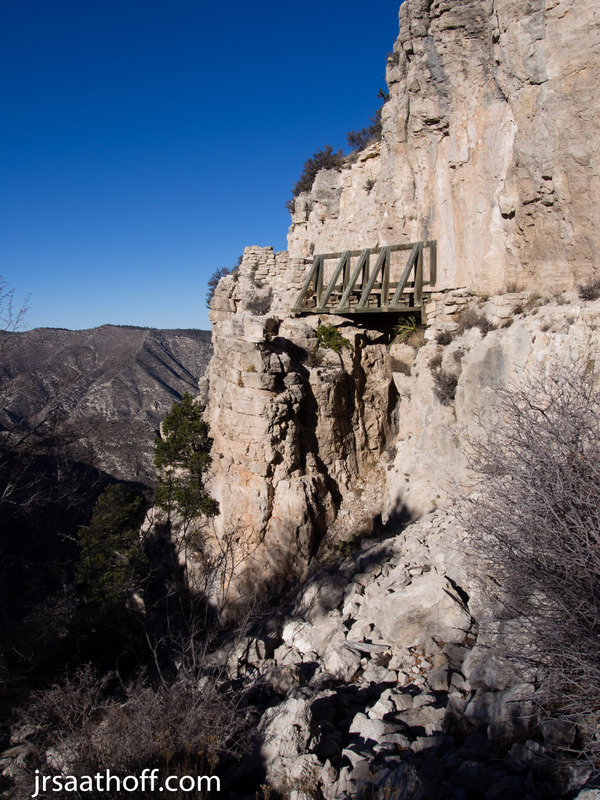 It’ll be another four miles, along the steepest trail in the park, before reaching the campground. 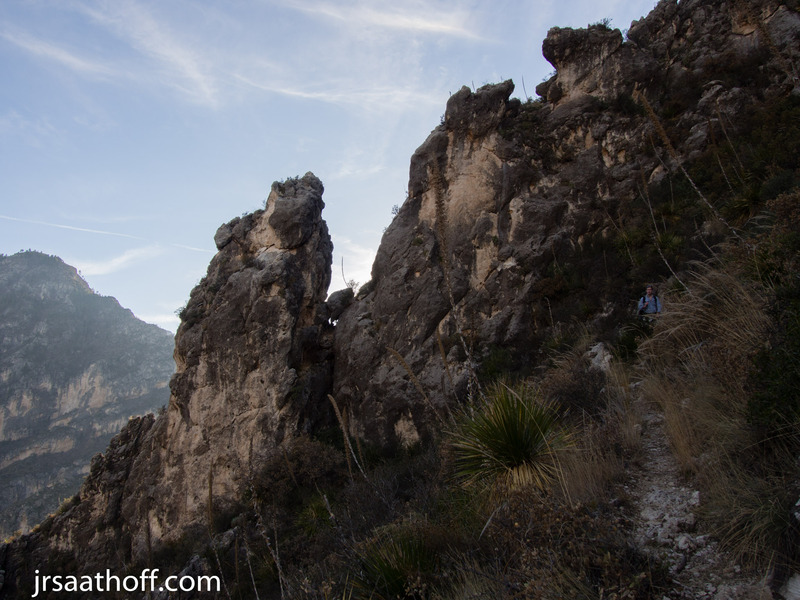 Shortly after leaving the Grotto, the trail changes from a nice easy path, to switchbacks. Nothing but switchbacks. We started this part of the hike late in the day (approximately 2pm), and the trail was almost completely in the shade. 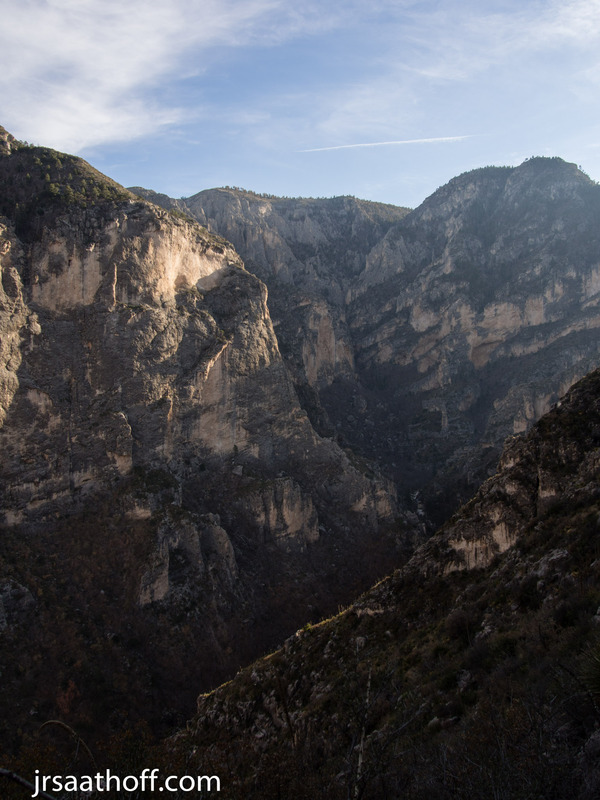 You’ll have some amazing views of the canyon as you slowly climb, and if you pay attention to the rocks here you’ll see an abundance of fossils in the limestone layers, formed from the ancient Caspian reef. 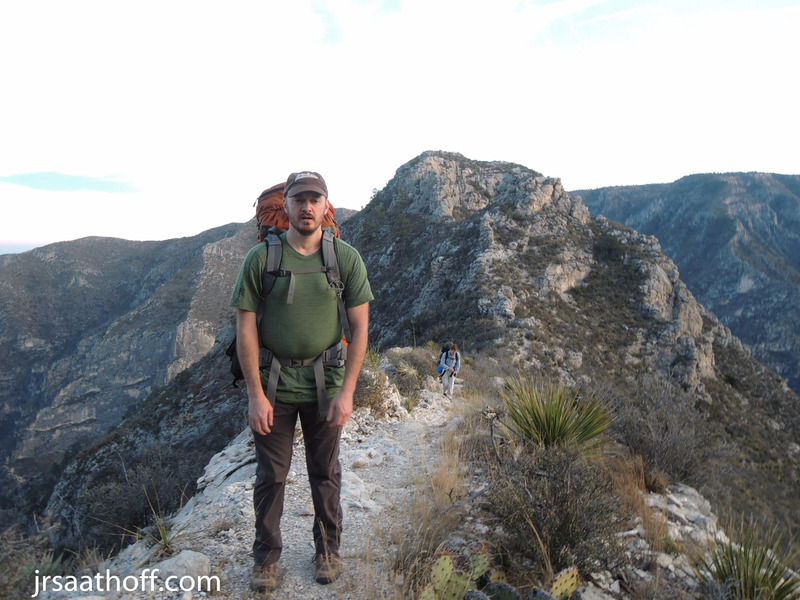 After the switchbacks, there’s still about of mile of hiking before reaching the well marked campground. 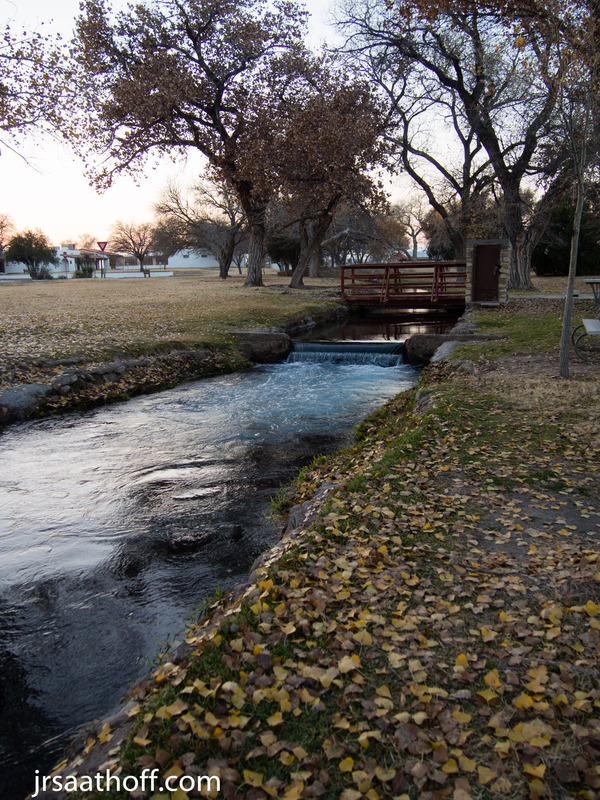 This campground has eight sites, most of which are in fairly close proximity to each other. 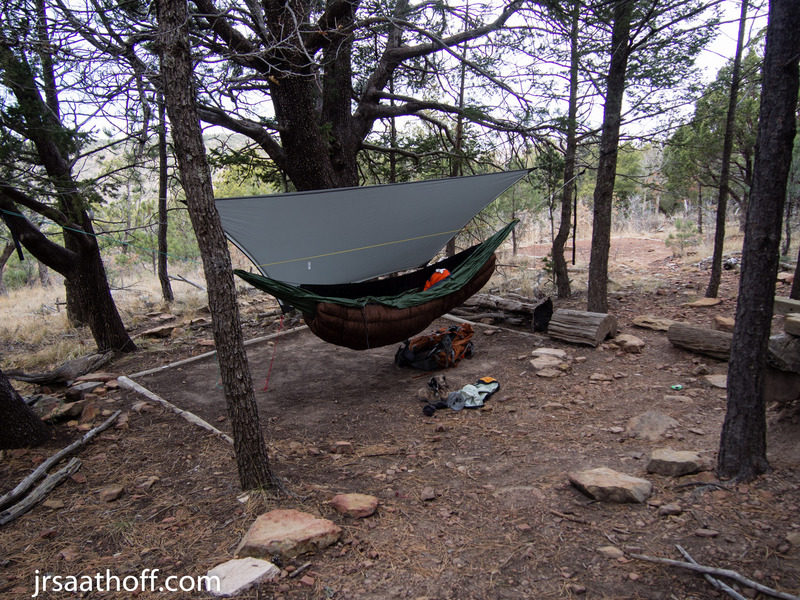 The tent pads are well marked, and there’s penty of trees here, so hammock camping wasn’t a problem. The night we were there the temperature only reached about 50°F, and the wind posed no problem at all. 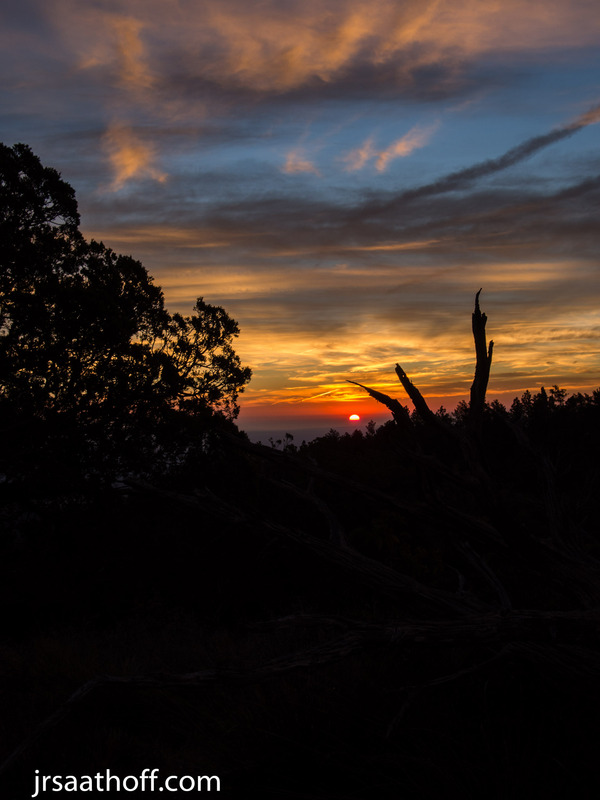 There’s a great spot to view the sunrise right outside the campground along the main trail (turn left on the main trail from the campground, and there’s a great viewing spot on a rock ledge just past the slight ascent). Although exhausted from the previous day, this was still a pretty nice easy hike. 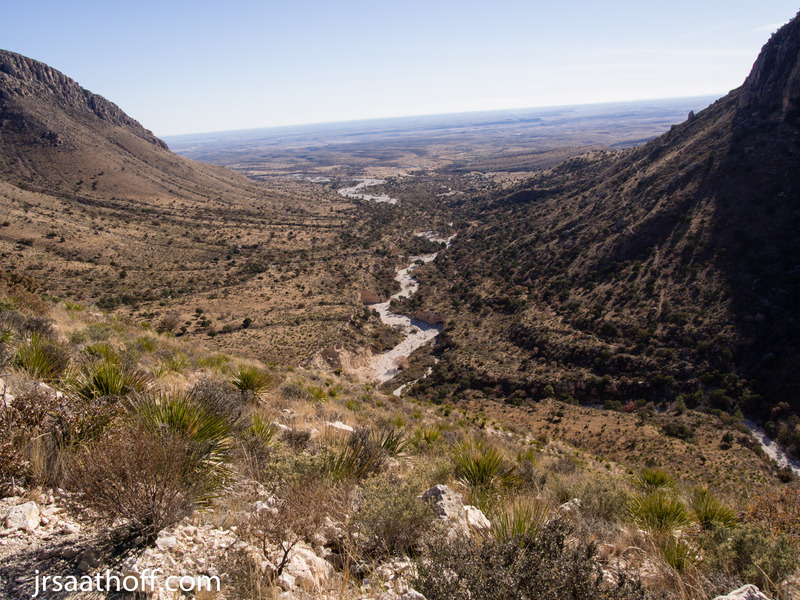 It was only 5.8 miles, and we faced significantly less elevation change than from the previous day. 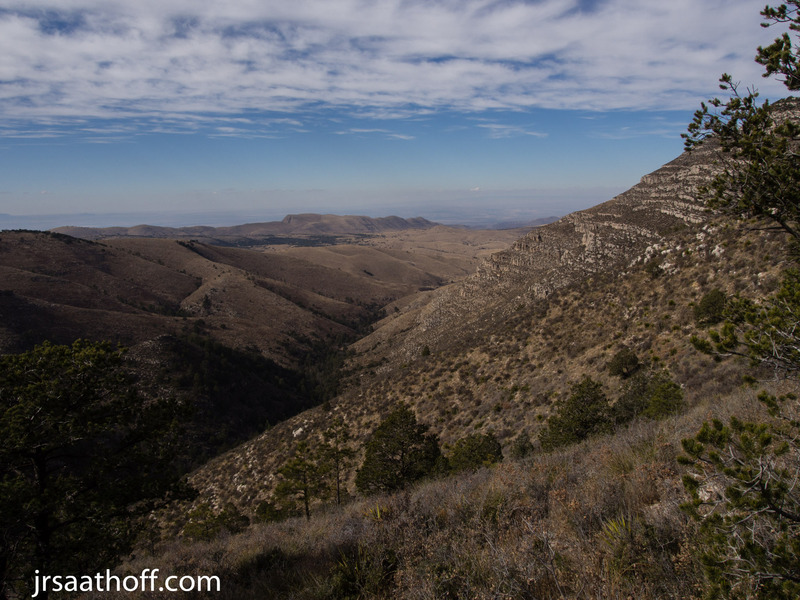 The hike traversed the ridge in many spots, giving breathtaking views of the valley before descending down into tree cover and switching to the tejas trail. 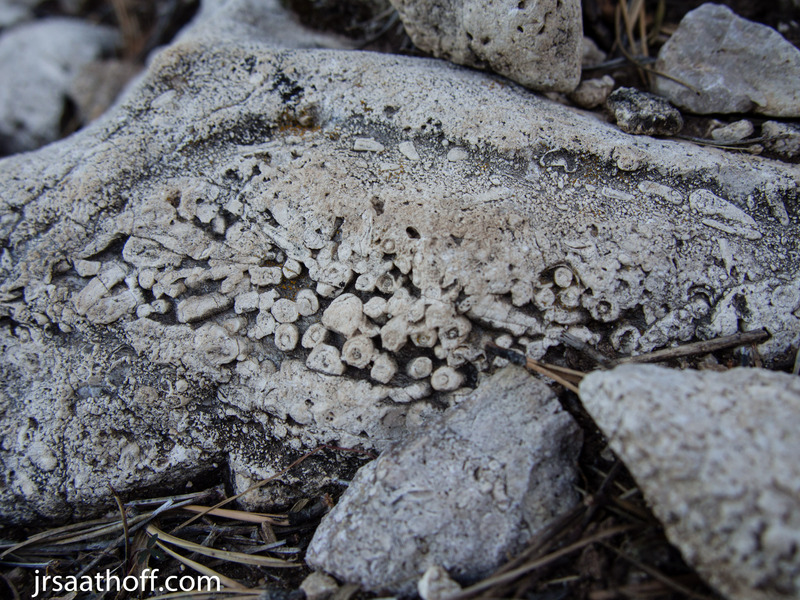 The trail merges with a white stone wash in many places, but it was never too difficult to identify. 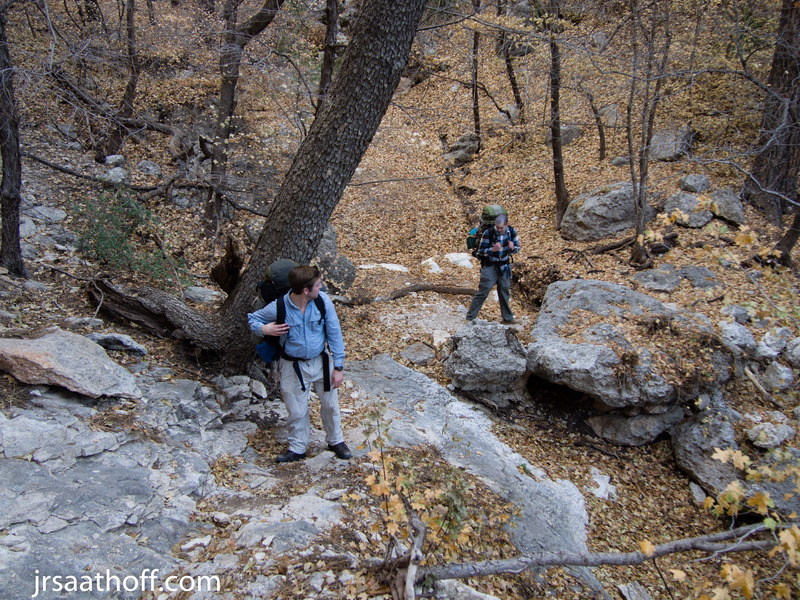 Hiking along the tree covered trail, we soon passed the Mescalo campground, and later arrived to the Tejas campground. We hadn’t seen anyone else along the trail so far, so were were a bit surprised to find to other backpackers at this site. Although friendly enough, we each set up on opposite sides of the rather large campground. There were still plenty of trees here for hammock camping, but I found that the locations of most of the pads were slightly too far away from trees for easy hammock setup. That said, I still had no problem finding a spot to set up. This night the temperature got down to approximately 30°F (there was a touch of ice in my water bottle the next morning). 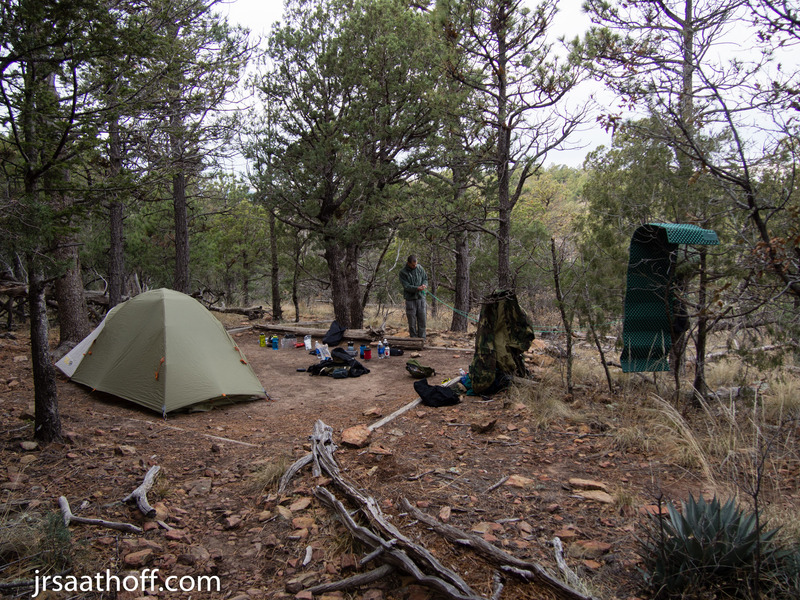 Also, the lower elevation and abundance of trees meant there weren’t any issues with wind blasting through the campsite. 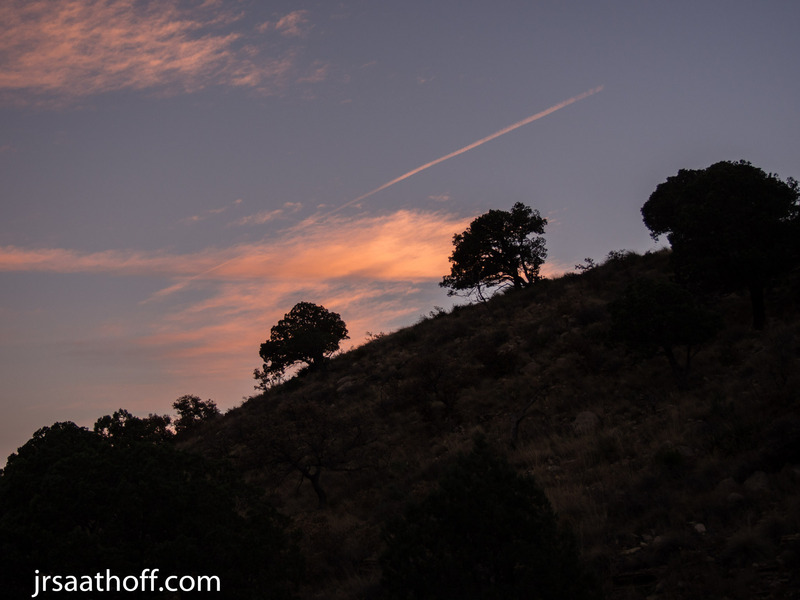 We timed this camping trip just about perfect, because the night we stayed in this backcountry campground was the expected peak of the Geminid meteor shower, and due to the low light pollution present in the park (particularly in the backcountry) we had an amazing view. I saw probably half a dozen meteors in the short time I was watching, several of which were the brightest I’ve ever seen. 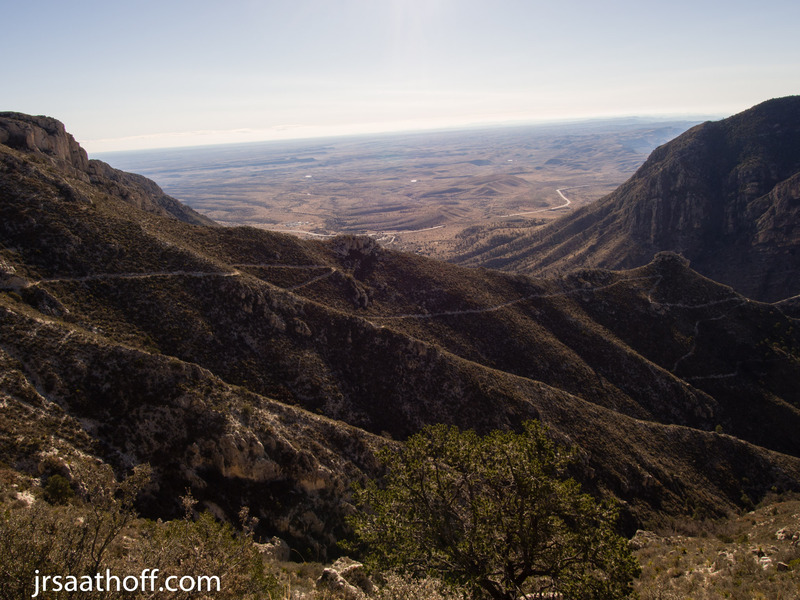 We decided that we wanted to summit the Guadalupe Peak as soon as we completed this hike, so we did a quick hike out that morning. 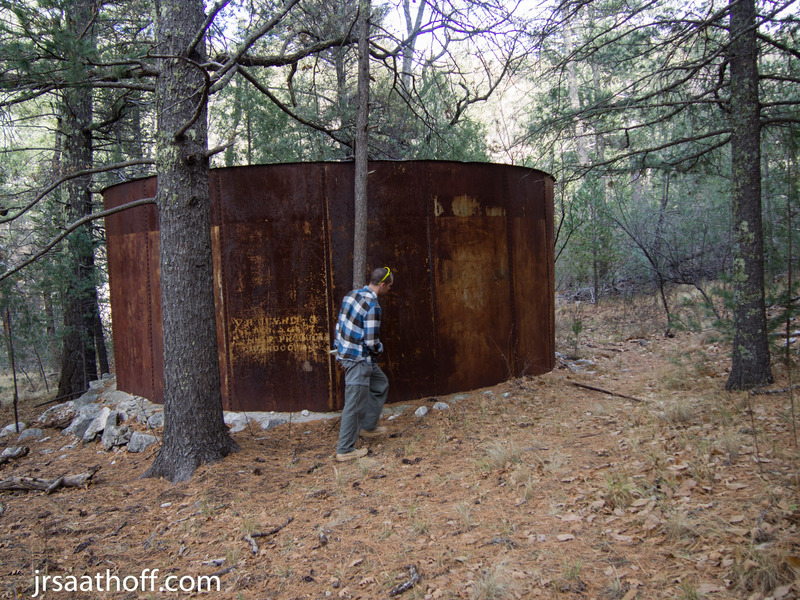 With hardly any food or water remaining in the pack, we were able to make really good time down the 5.5 mile trail to the Pine Springs trailhead, completing it in approximately three hours. 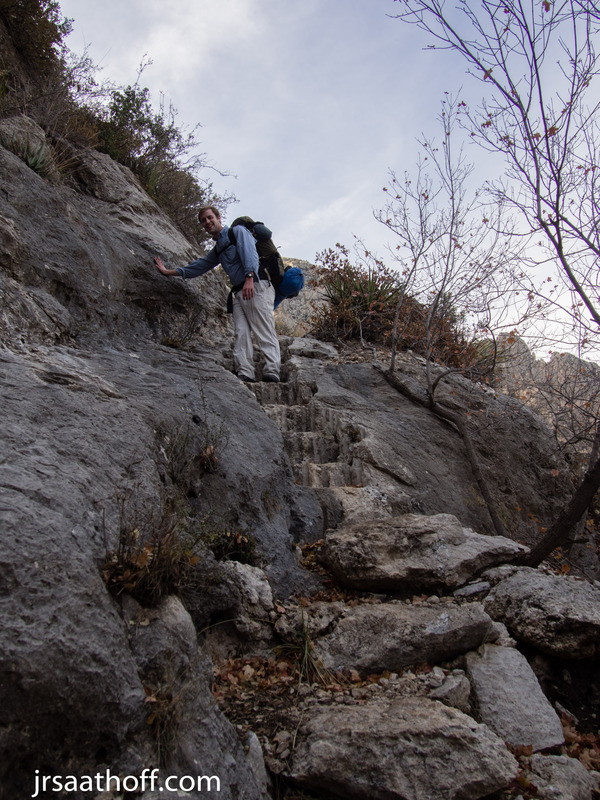 The last few miles of the trail go down a rather steep decline. 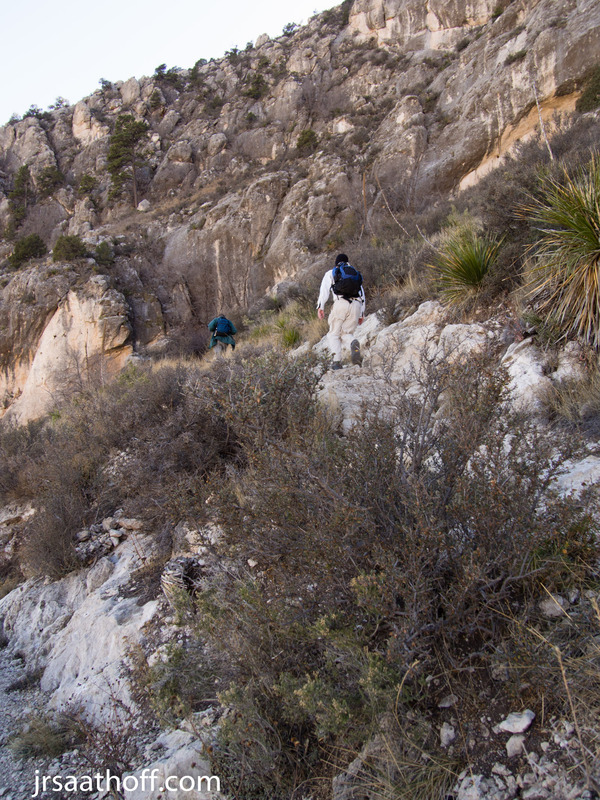 The trail is very exposed, and the winds were absolutely brutal. 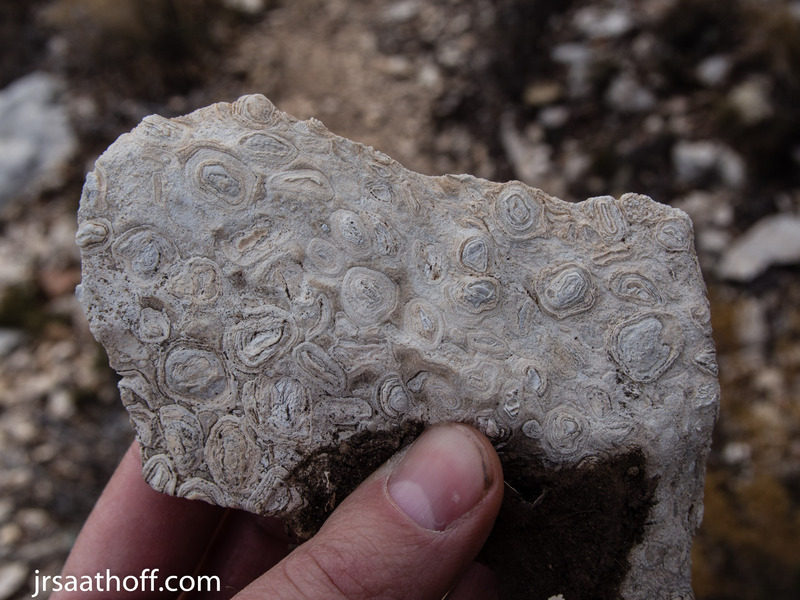 Several times I had to grab onto rocks to avoid being knocked down by the gusts of wind. 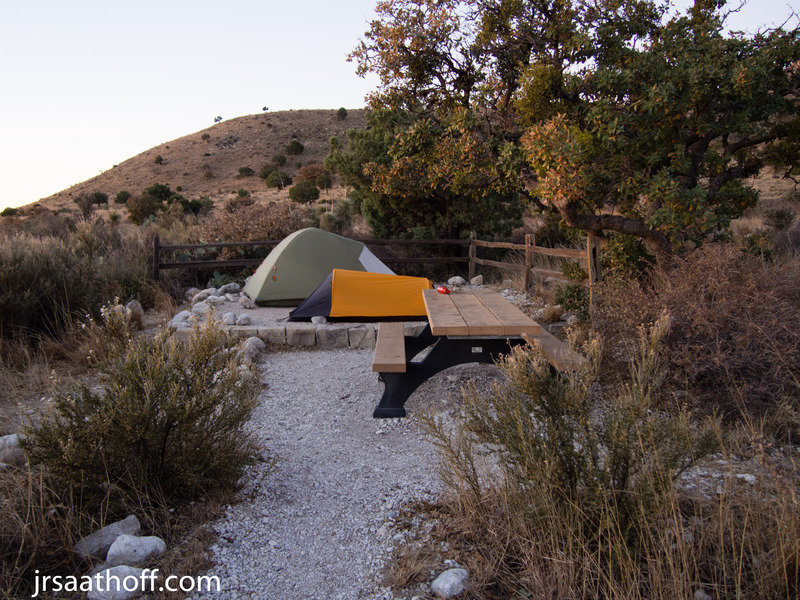 Since the campsites are first-come first-serve, we went ahead and grabbed one before heading up to Guadalupe Peak as a day hike. It took us longer to get ready to go out on the trail than expected, so we didn’t get started on the trail until close to 2 p.m. Based on our times for the previous days, we were pretty confident we could make it back off the trail before sunset, but brought our headlamps and cold weather gear just in case. It ended up taking us 4.5 hours (the NPS says it’s generally 6-8 hours), which put us back at the trailhead right as the sun was setting. As a day hike, it’s 8.4 miles and approximately 3000 feet of elevation change. 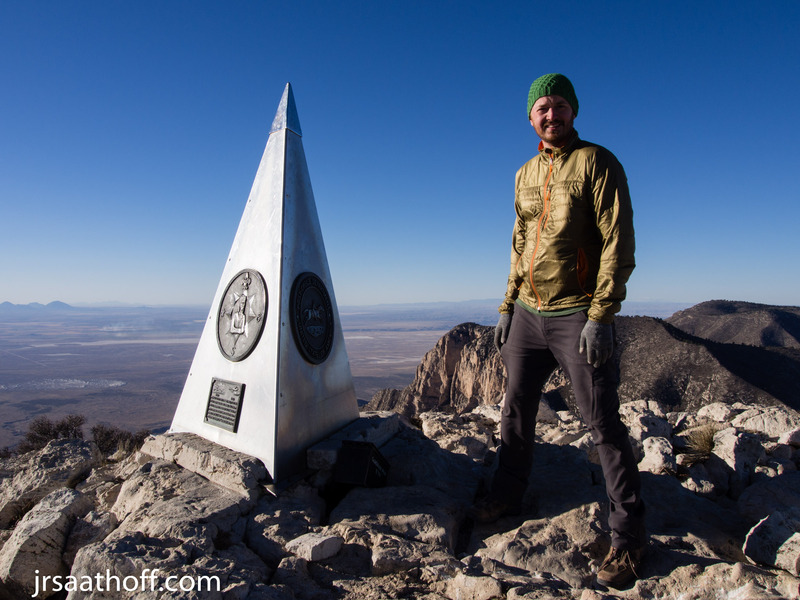 Other than the elevation change, the trail was easy, with no scrambling, all the way to the summit. The wind in certain sections of the trail was brutal. 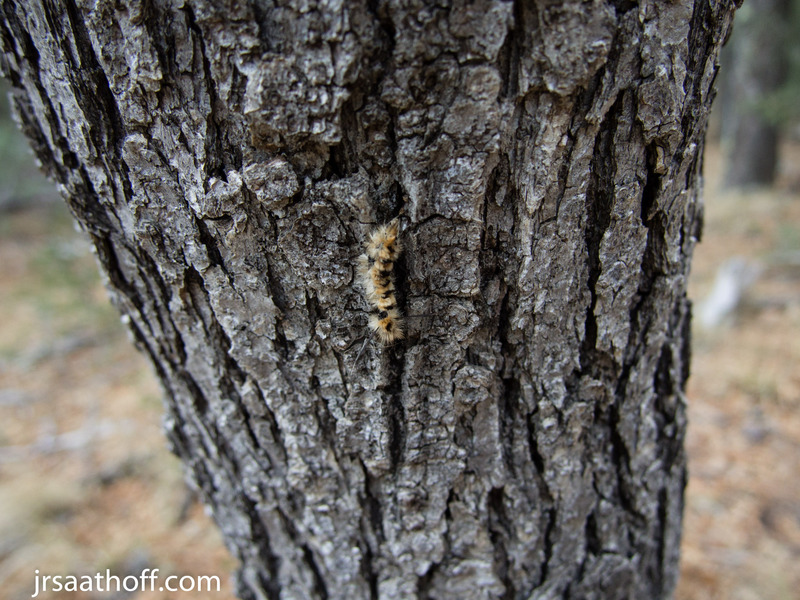 Several times on the trail I ended up dropping to the ground to avoid being pushed around by the gusts of wind. 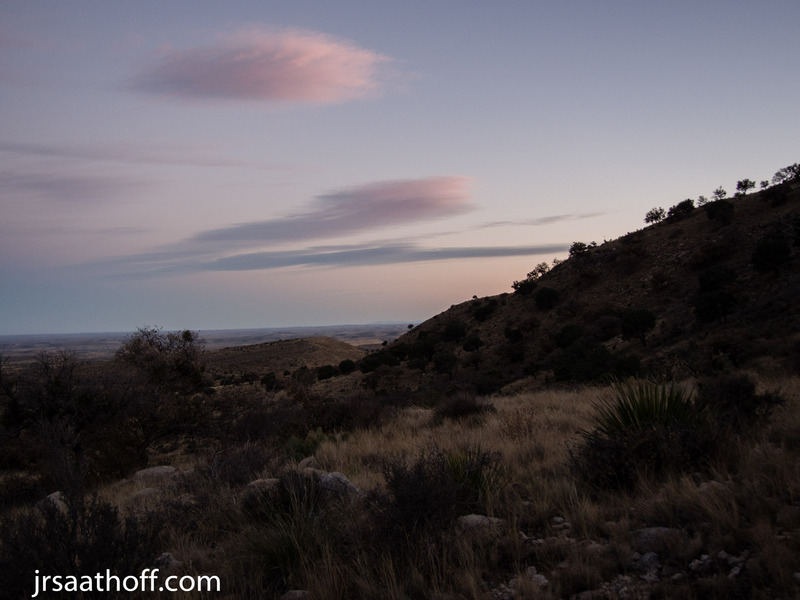 At the campground, the wind was gusting at 50 Mph, and it must have been at least that on the trail we were hiking. Surprisingly, despite how bad the wind was on the trail, the peak had very little wind at all. The views from the summit was amazing. 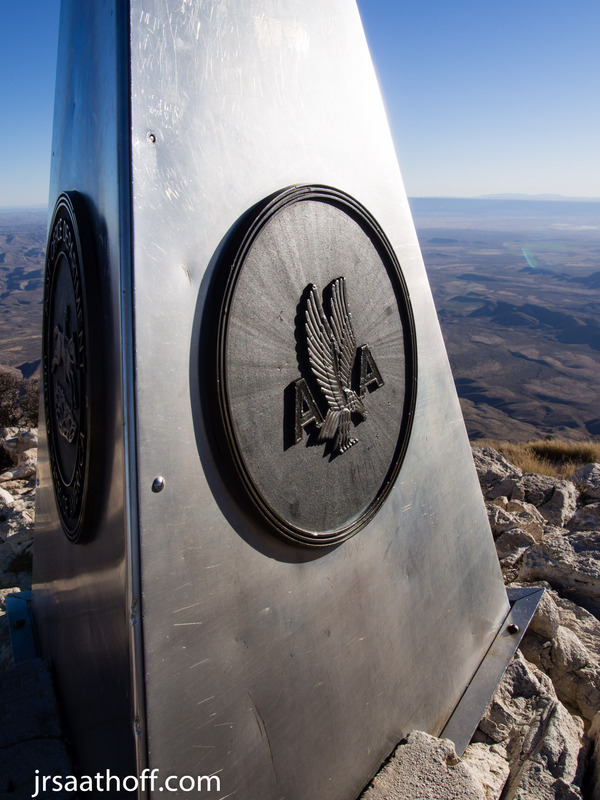 Strangely, the summit marker has a giant American Airlines logo on it (it was installed before it became a national park), but the marker itself looks really cool and is a great photo op with the views in the background. 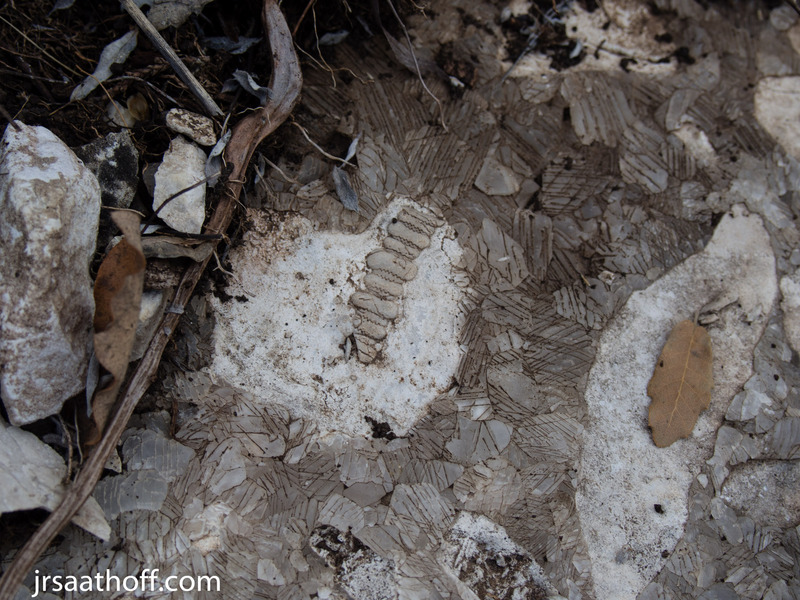 Even here, at the highest point in Texas, you can look at the rock and see a lot of fossils embedded in the limestone that forms the peak. Unsurprisingly, we made much better time on the descent, and reached the bottom of the trail just in time to catch the sunset.